Since the apple shape is the top heavy shape so outfits must be chosen so as to draw attention away from the upper body. A contrasting colour lehnga with ample pleats and thin waist line would suit the best to such body shape. Jewellery should include heavy kamarbandhs and neck lines usually V shape or U shape. Never go sleeveless. For this shape, a contrasting colour straight fall lehenga or an ‘A-cut’ lehenga must be worn as the main idea is to draw attention on the torso and upper body. Wide sleeves should be preferred and jewellery should include heavy Choker or Mughlai style necklaces. Go for neck-lines that widen your shoulders visually, such as Scoop-necks, Sweetheart necks, Boat-neck or strapless necks. You can also opt for designer shrugs matching your lehnga. This is the most ideal shape and some women are blessed with such shape. Go for solid colour lehngas avoiding sharp contrasting colours with voluminous pleats and vertical embroidery so as to even out the shape of the hip and thighs. The V-halter necks and U-shape necks would go well in case of neckline. 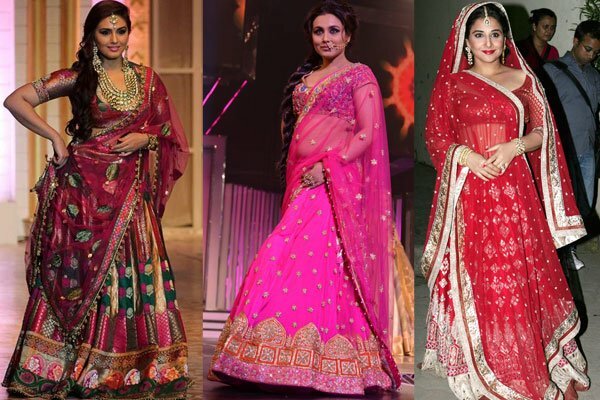 Now that you are aware of your body shape and the type of lehnga, choose accordingly. Don’t get confused of venues and select the best venue for your wedding only with VenueMonk.